The storm that whipped the Northeast over the weekend with six to 16 inches of snow has blown off to Canada, but more snow is on its way - maybe just enough to bring out some of that holiday spirit. 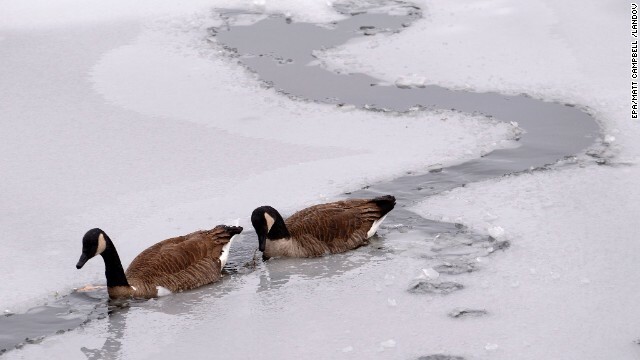 The flakes sweeping across the Midwest and Northeast on Monday and Tuesday aren't expected have the heft of the fast-moving storm that preceded them but are predicted to add a couple of inches to the wintry landscape. What is it like to be thrown behind bars when you're 16 and told you'll languish there for the rest of your life? All for a crime you adamantly claim you didn't commit. He was convicted of arson in a fire that killed 29 people. On Tuesday, at a retrial in Tucson, Arizona, he will plead 'no contest' and walk free. After almost 43 years. Filed under: Arizona • Christmas • Courts • Crime • Holidays • Justice • U.S. If you're off school or work Monday in observance of Presidents Day, you've got it all wrong, at least according to the federal government. Federal offices are closed Monday because it's Washington's Birthday, a holiday to honor the first U.S. president, George Washington. "This holiday is designated as 'Washington's Birthday.' Though other institutions such as state and local governments and private businesses may use other names, it is Federal policy to always refer to holidays by the names designated in the law." Washington's actual birthday was February 22, and that's when the holiday was originally celebrated. However, in 1968, Congress passed the Uniform Monday Holiday Act , which designated the third Monday in February as Washington's Birthday, beginning in 1971. 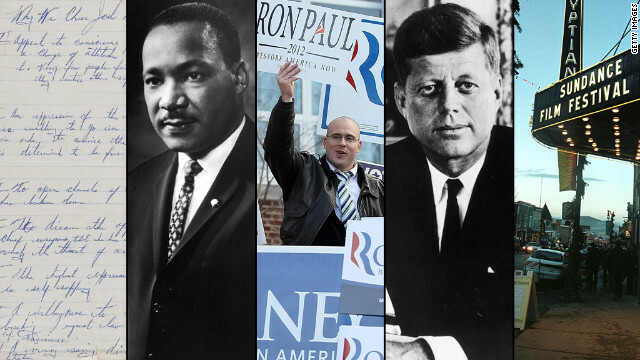 The Presidents Day moniker evolved later, at least partly to honor Abraham Lincoln, whose birthday was February 12, but some hoped it could be a day to honor all presidents. Of course, states, local governments and businesses are not bound to honor the Uniform Monday Holiday Act, so they can call Monday whatever holiday they like or not have one at all. Shoopers are used to seeing Christmas displays early in the shopping season, but one Canadian retailer says the first week of November is too early for Christmas music. 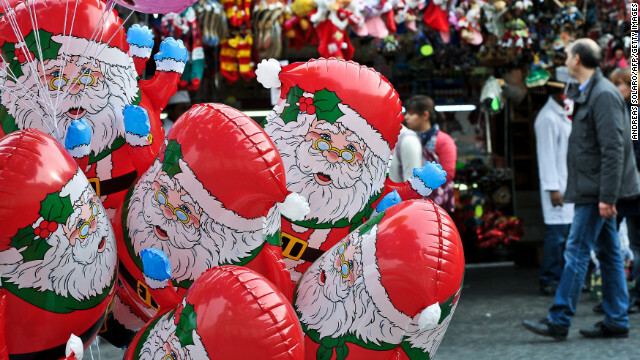 It’s a question most of us seem to have pondered at some point: When should stores start on the Christmas season? For one Canadian drugstore chain, the first week in November is too soon, at least for the sounds of the season. 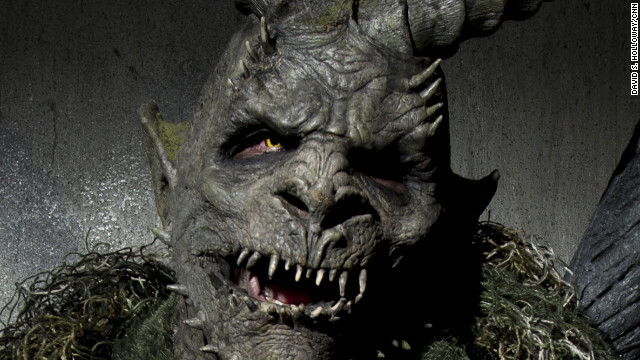 Netherworld in Norcross, Georgia, featuring this monster is among the 1,200 estimated U.S. haunted houses charging admission. It’s Halloween, as if you and your wallet didn’t already know it. With all the candy, parties and fancy costuming for kids and adults alike - even cutting corners, rounding out the blue-tuxedo "Gangnam Style" outfit might have set you back a penny or two - Americans are expected to spend about $8 billion on the event. Looking for a thrill, or some last-minute costume inspiration? We have you covered. The San Francisco Giants celebrate after the team beat the Detroit Tigers in 10 innings to win the World Series Sunday. The Giants will be riding high in ticker tape today, when San Francisco welcomes home the 2012 World Series winners. The team's colors are orange and black, so it's fitting that it is Halloween. Festivities kick off at 11 a.m. The parade will begin on Market Street and stretch to the Civic Center Plaza. 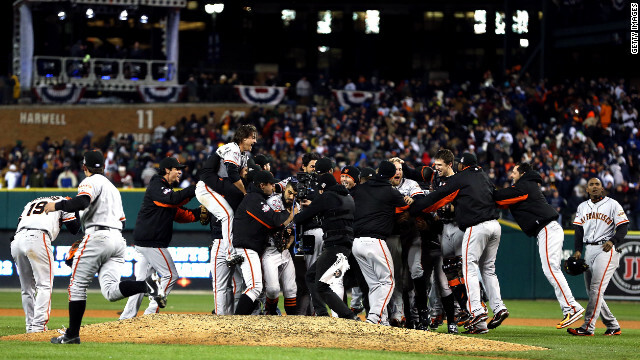 For the second time in three years, the Giants claimed Major League Baseball's top prize. Completing their sweep of the Tigers took extra innings, but the Giants prevailed 4-3 Sunday night. A little girl was fighting for her life early Monday after she was shot outside a Halloween party by a relative who mistook her costume for a skunk. Police in western Pennsylvania's New Sewickley Township said the 9-year-old girl was dressed in black with a black hat for the Saturday evening party. As the two to three dozen guests milled about, the girl went to hide on the edge of a hill. Filed under: Halloween • Pennsylvania • U.S.
On Monday, people across the United States will be sending the summer season a final salute as they celebrate Labor Day's extended weekend. Grills will be fired up, opening games of the college football season will be rehashed and vacations will be squeezed into the calendar for one last hurrah until the winter holidays. Just beware that in the middle of all the celebrating, gas prices will be higher and travelers will make traffic heavy. But don't worry - the gas prices, according to CNNMoney, are expected to drop back down. As for our coverage, Eatocracy is on hand with not only the best hot dogs for your backyard shindig, but an entire collection of the best tips and recipes for the ultimate summer send-off. CNN Money also has a gallery of Labor Day getaways on one tank or less to ease your spending woes. Want to know the real, embattled history of this holiday that gives us an extra relaxing day off of work? Author and historian Kenneth C. Davis spells it out in his eloquent opinion piece - and just why we shouldn't take this September 3 for granted. Also, get to know Labor Day by the numbers. Grab your Labor Day weekend forecast here and if you're still stumped on where to go, JD Rinne of Jetsetter.com share her picks with us for last-minute getaways. We'd also like to know how you'll be spending your Labor Day - where you're going, what you're cooking, who you're spending it with. Do you have any traditions you observe every year? Did Davis' history of Labor Day surprise you? Let us know in the comments below. 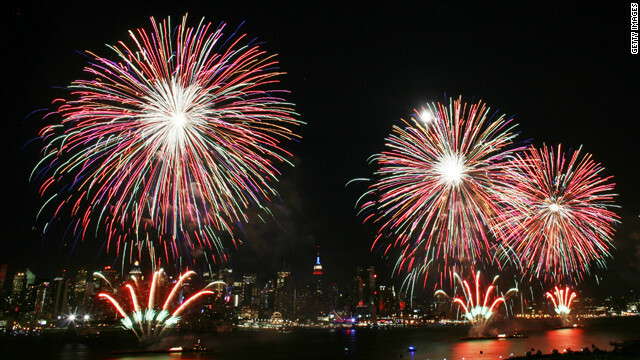 Summer fare will sizzle on the grill and fireworks will light the night sky as America celebrates its 236th Independence Day on Wednesday. And in Coney Island, someone will attempt to wolf down the most hot dogs, with buns, in 10 minutes for prize money and the Mustard Belt in the yearly Nathan's Hot Dog Eating Contest. Filed under: Fourth of July • Holidays • U.S.
Fireworks explode over the Hudson River on July 4th, 2009. Fireworks and the Fourth go together like peanut butter and jelly. But if you’re tired of the same old fireworks display year in and year out, we’re commemorating Independence Day by offering these unique fireworks festivities. Bikini-clad women did a swift business selling fireworks in 2009. Learn what other “nearly naked” bikini stands the owner considered opening. Female employees are showing off their, uh, patriotism at this fireworks stand in Washington. Bikini-clad women did a swift business selling fireworks in 2009. 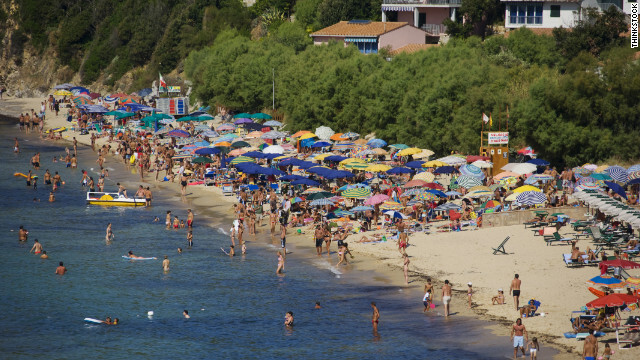 Learn what other “nearly naked” bikini stands the owner considered opening. This Colorado town is offering a chicken “fireworks” show instead of the more traditional display. Watch chickens get launched out of a mailbox with a plunger. This Colorado town is offering a chicken “fireworks” show instead of the more traditional display. Watch chickens get launched out of a mailbox with a plunger. The Sydney festivities come with glowing wetsuits and surfboards. 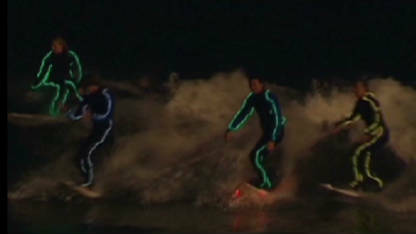 Watch these Aussies light up the night as they ride the waves in style. This fireworks celebration may not be on the Fourth of July, but the Sydney festivities come with glowing wetsuits and surfboards. Watch these Aussies light up the night as they ride the waves in style. CNN’s Matt Abshire contributed to this post. With wildly high temperatures, wicked weather and wildfires across the country, there are more warnings than usual posted about fireworks safety this year. In addition to harming themselves, people are also in danger of lighting up their entire neighborhoods. "What people don’t realize is while they’re setting off fireworks and sparklers in this hot, dry heat or wind, that fires can move very quickly, putting their neighborhood directly in threat," said Mike Apicello, a spokesman for the National Interagency Fire Center in Boise, Idaho. "Look for open, wide spaces to ignite fireworks, and stay away from fire fuels such as grass, which in this type of heat, cure out really fast. And with the high winds, all it takes is an ignition, even in an urban environment. A bottle rocket on a shake roof would ignite a fire very rapidly. "Our fire resources are going to be very busy across the nation this July Fourth, so please use caution," he said. In the event of high winds, drifting embers can easily start a fire, so if it's too windy for you to safely ignite, it's best to set the sparklers aside for another day. Apicello advises checking locally before you do anything, adding that fireworks are not allowed in national parks. Each year, more than 100 fireworks-related injuries are reported to hospitals, according to the National Council on Fireworks Safety. Last year alone, 65% of those injuries happened, not surprisingly, during the 30 days around the Fourth of July, the U.S. Consumer Product Safety Commission reported. Filed under: Fourth of July • Holiday safety • Holidays • U.S. It's estimated that 94 million Father's Day cards are exchanged annually, according to Hallmark. Every year on the third Sunday in June, we celebrate Dad with his own day. The idea sprang from the mind of one woman who thought that fathers, just like mothers, deserved their own holiday. Sonora Louise Smart Dodd of Spokane, Washington, celebrated the first Father's Day on June 19, 1910 - her father's birthday. In 1924, President Calvin Coolidge publicly supported a national Father's Day, and in 1966, President Lyndon Johnson proclaimed it a national holiday. Following up in 1972, President Richard Nixon signed a permanent U.S. Father's Day into law, observed on the third Sunday in June. Father's Day is also the fourth-largest card-sending occasion. Here's a breakdown of the other intriguing numbers that follow this holiday. 1.7 million – The number of single fathers in the United States in 2011. 170,000 – The number of single fathers raising three or more children. 176,000 – Estimated number of stay-at-home dads in the U.S. in 2011. 94 million – Estimated number of Father’s Day cards exchanged annually, according to Hallmark. 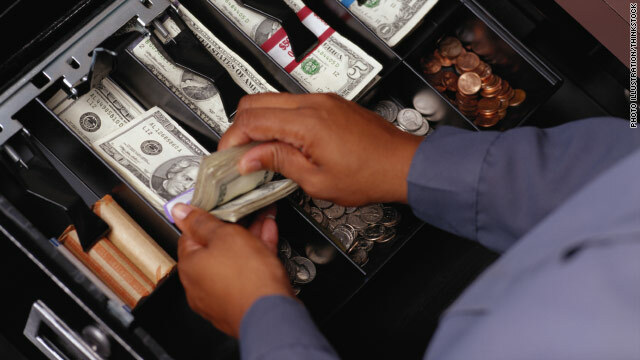 $117.14 – Estimated amount that the average person will spend on Father’s Day gifts in 2012, according to the National Retail Federation. 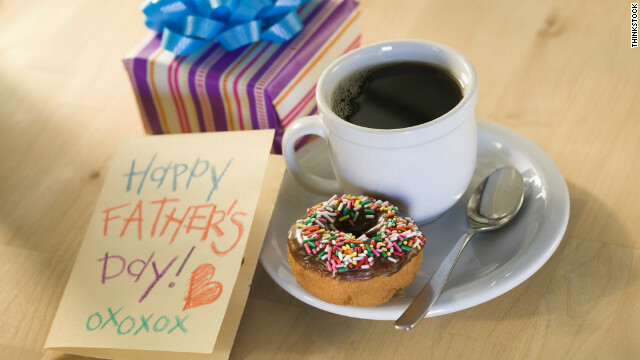 $12.7 billion – Estimated amount that consumers will spend on Father’s Day cards and gifts in 2012. 1972 – The year President Richard Nixon signed the law that designates the third Sunday in June as Father’s Day. 92 – Age of Les Colley of Australia at the birth of his son Oswald in 1992. He holds the Guinness World Record for the oldest man to father a child. 0 – Number of children fathered by Presidents George Washington, James Madison, Andrew Jackson, James Polk, James Buchanan and Warren Harding. 1 – Highest chart position on the Billboard Hot 100 for “Papa Don’t Preach” by Madonna. $15 – Cost of a loaf of “Papa Don’t Peach” bread made by Breadwinner bakery in Atlanta. 3 – Number of awards won by the Temptations’ song “Papa Was a Rollin’ Stone” at the 1972 Grammy Awards. 50 – Number of years the Rolling Stones have been together with Mick Jagger as lead singer. 7 – Number of children fathered by Mick Jagger. Here on CNN.com, we're also celebrating "Dear Old Dad" with our special coverage. Be sure to check this ultimate guide to the stories that pay tribute to Dad, whether he's no longer with us or enjoying Sunday's holiday on the couch with his favorite meal, and his favorite people. "So glad I'm an unique snowflake and we don't celebrate this day. 'Oh, I love you more than anything on THIS day only!' We pick a random day to celebrate, and it works for us." Many of our readers are eschewing stereotypical Valentine's Day celebrations, saying dinner at Waffle House and other humble trimmings are perfect for love. One reader swears by the restaurant chain. Rebecca: "Waffle House has long been my Sweetie's and mine's 'secret' Valentine's destination. Good food, great service (none is better than Ms. Pat in North Augusta, South Carolina! ), and a fun lively atmosphere - all at a reasonable price! The perfect thing for lovers of all ages and purse sizes!" Some found lasting love there. Jason: "I proposed to my wife at a Waffle House in Harrisonburg, Virginia. Amazingly, she said yes and we are married nine years now." 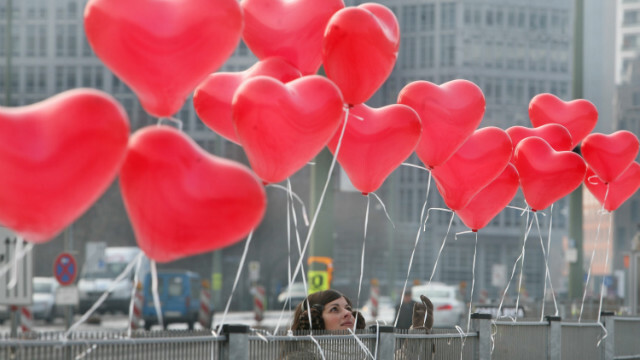 Germany is for lovers: A woman strings balloon hearts to a fence Tuesday in Berlin. At least one CNN.com reader thinks we're grouping Valentine's Day with that other special day the Mayan calendar predicts is coming this year - the end of the world. The reader was responding to a report from CNN's Thom Patterson, who looked into how Valentine's Day, and our idea of romance, has changed with the advent of texting, reality shows and social media. Emory University English professor Mark Bauerlein wonders whether Facebook has killed the love letter. "Romance is alive and well, I see it all the time and deliver on it all the time. To suggest that there is anything wrong with 21st-century love is ridiculous and somewhat arrogant of the experts to tell people how to conduct a romance, something that is very personal, private and unique. "More doomsday garbage from CNN!" wrote commentator notbobslc. Monday is Martin Luther King Jr. Day, one of 10 national holidays in the United States. Besides marking the day as a federal holiday for the 26th time, January 16, 2012, begins a new age of online accessibility for those wanting to know more about King and his work. The King Center Imaging Project, which makes 200,000 of the civil rights leader's documents quickly accessible online, goes live Monday. King's "I Have a Dream" speech, his Nobel Peace Prize acceptance speech and his letter from a Birmingham, Alabama, jail are among the documents available. The Martin Luther King Jr. Center for Non-violent Social Change in Atlanta and JPMorgan Chase & Co., working in partnership with AT&T Business Solutions and EMC, are responsible for the project. The memorial to Martin Luther King Jr. has sparked controversy, and perhaps this is fitting. He was a controversial man whose humanity - and words - still speak volumes today. We’ve all know Santa makes his list and checks it twice. But that’s not all he does. We’ve got an insider’s look at what Kris Kringle does to prepare for his big day. It may not all be what you expect. 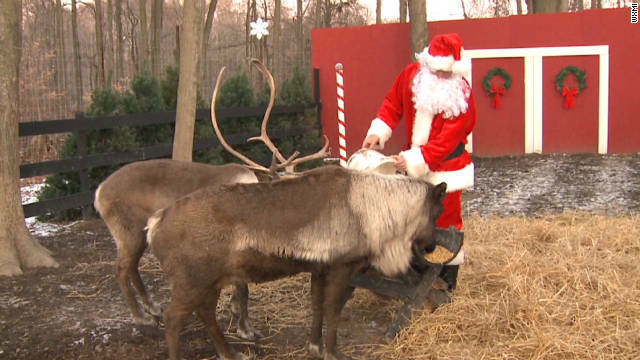 Reindeer games – Santa’s reindeer need year-round care for their epic 24-hour journey on Christmas Eve. Now, you can check in on Dasher, Dancer and the rest 24 hours a day, seven days a week via webcam. Each day at 5 p.m. ET, Santa comes out to feed his reindeer and check his mailbox for letters from kids around the globe. 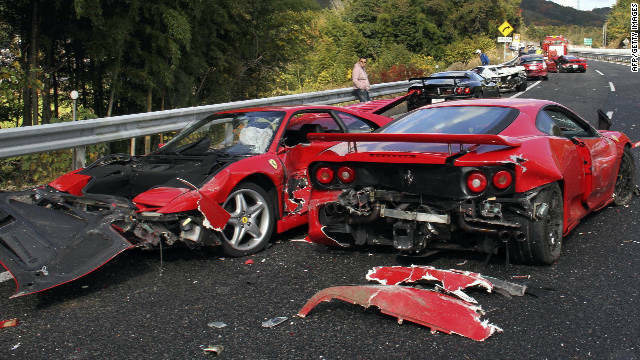 Several supercars were involved in a 14-vehicle pile up along a stretch of the Chugoku highway in western Japan. In what may be one of the most expensive car wrecks in history, 14 high-end luxury cars were demolished in a highway pileup in Japan this weekend. The totaled supercars included eight Ferraris, three Mercedes-Benz cars and a Lamborghini. Today, we decided to take a look back at some of the craziest highway moments. Multi-million dollar wreck – A group of luxury car enthusiasts were driving on Chugoku Expressway in southwestern Japan when witnesses say one driver skidded out of control and started a chain-reaction crash. Several drivers were hospitalized but no one was seriously injured. 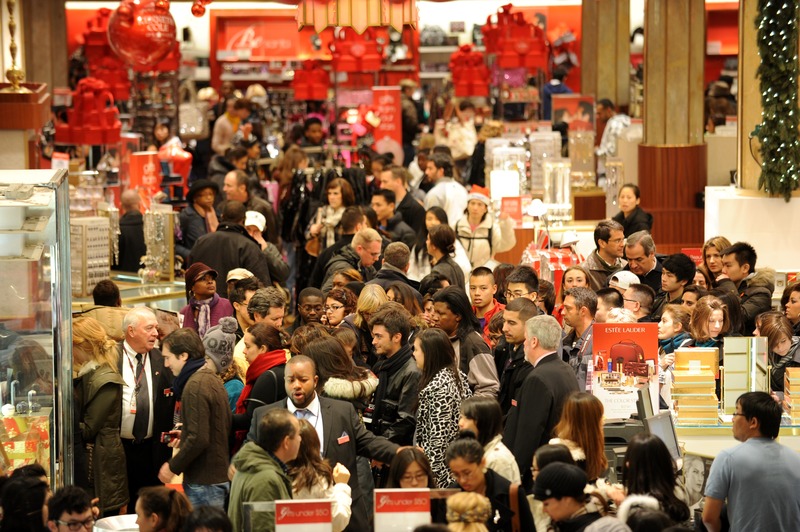 People crowd the aisles inside Macy's department store November 25, 2011 in New York after the midnight opening to begin the 'Black Friday' shopping weekend. The madness of Black Friday is behind us. Despite an increase in sales it was a day marred by violence at several stores. As we enter Cyber Monday, bargain hunters will be able to take advantage of sales online instead of having to risk hand-to-hand combat in the aisles. While you browse the Web for deals, take a look at some of the craziest moments from Black Friday, from shoppers rioting over a waffle iron or going to great lengths to get a spot in line. Woman pepper-sprays shoppers – Police say a woman pepper-sprayed fellow customers on Black Friday to make sure she got a hold of a deal at a Los Angeles Wal-Mart. The woman then proceeded to pay for her items and leave before police arrived. Crabs were ready for the pot last Thanksgiving season in San Francisco. A couple of turkeys got a Thanksgiving pardon from President Obama at the White House on Wednesday, but beneath the Pacific Ocean, thousands and thousands of crabs will be around for a holiday they normally experience from a pot and a plate. 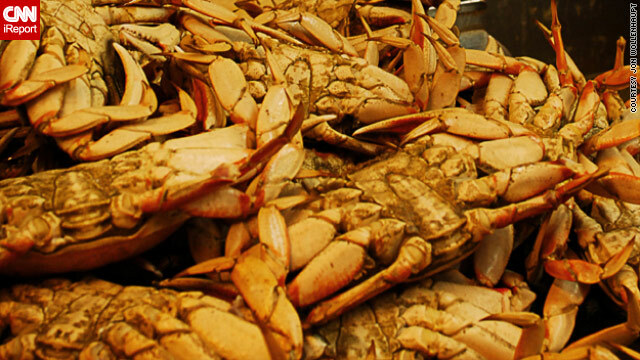 Dungeness crab have traditionally been served on Northern California tables along with the turkey and trimmings for Thanksgiving. This year, however, a price dispute between crab fishermen and processors has left market shelves and restaurant menus bereft of the crustaceans, according to media reports from the Bay Area. Crab fishermen want $2.50 a pound for their catch, but processors are offering only $2, so the fishermen are staying in port, and traps aren't going into the sea, the San Francisco Chronicle reports. "I feel terrible, because I know everyone loves Thanksgiving crab, but we can't work for nothing," Larry Collins, head of the San Francisco Crab Boat Owners Association, told the Chronicle.